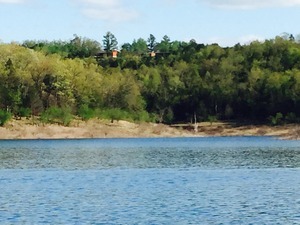 Bull Shoals Lake's clear, open waters are perfect for fishing and numerous other water sports such as scuba diving, snorkeling, and water skiing. Hikers, photographers, and wildlife enthusiasts alike appreciate the Ozark mountains and land for its diversity of birds, animals, flowering trees, and wild plants. as well as nearby restaurants. We also have the latest Arkansas Fishing Guidebooks and Bull Shoals Lake Maps. Hunters are welcome to this great area for deer and turkey. Located just south of the Missouri state line, the small Oakland community offers a café, a marina and the serene beauty of the Ozark Mountains. We are located just 5 miles from Oakland Marina. We are 30 minutes from Mountain Home, AR and Gainesville, MO and 29 minutes from Bull Shoals White River State Park. Mountain Home has a variety of restaurants, two movie theaters, banks and ATM’s, churches, grocery stores, a 24-hour Wal-Mart super center, and a bowling alley. Three 18- hole golf courses, and horseback riding, and Bull Shoals White River State Park are all within a 30-minute drive. Branson live music shows, shopping at Branson Landing, Silver Dollar City, The Great Passion Play in Eureka Springs, the original and largest Bass Pro Shop in Springfield, MO, and the Norfork National Fish Hatchery are all within a two-hour drive or less from Fish-un-time. If you have to cancel your reservation, please do so within 3 weeks (21 days) of your check-in date to avoid a $75 cancellation fee per cabin. Payment is due upon arrival. You will be charged for the number of days reserved even if you leave early. Check in is at 2:00 PM or later and Check out is no later than 11:00 AM. 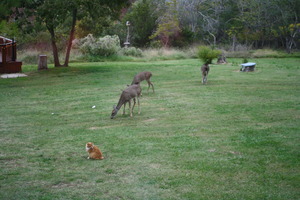 We are pet-friendly with a charge of $8 per night, per pet. Limit 2 pets per cabin. Pets must be on a leash at all times when on the grounds. Please pick up after your pet. If pets are left alone in the cabin for an extended period, they must be in a kennel.